We went to adopt Par Lucy, now Koda at the AG picnic in 2016. She was running in the large fenced area and even with several of us trying, it took over an hour to catch her. She was so very shy and terrified of our two children. She wasn’t much of a fan of other dogs and really didn’t want anything to do with them either. Just catching her and getting her into the van to take her home was a battle and clearly far outside of her comfort zone. 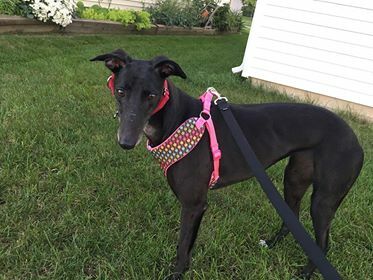 It took time, but she slowly warmed up and now has no problems with people and kids of all ages and sizes, and she loved her two greyhound brothers. She loves to instigate play sessions with her brothers and snuggles up next to the kids. Gone is the timid, fearful dog who hid from everyone and everything. She has become the sassy boss of the house who gives anyone who comes to the house and the neighborhood squirrels an earful.